This is the most simple type of lens, providing clear vision at a single focal distance. For most people, these lenses are made for either far, computer, or reading viewing distance. The basic version of this lens is mass produced in a variety of powers to have your correct prescription in the optical centre of the lens. When your eyes are not looking through the optical centre, the vision can get distorted or blurry. The amount of blur is dependent on the distance from the eye to the lens, the curvature (wrap) of the frame, as well as the lens power. For ideal vision, the lens should be centered exactly in the center of the pupil, in a well fitting frame that does not sit far from the eyes. Proper centration requires 2 measurements, monocular PD and OC height (see below for what these are). Without these measurements, centration is impossible. Because online eyewear purchases cannot take into account where your pupil sits in the frame, the only measurement they can use is the horizontal distance between your eyes (PD), not enough to properly center the lens. This lens provides your ideal prescription across the ENTIRE lens, allowing for better clarity when you move your eyes. This type of lens came to market a few years ago to address the problem of digital eye strain. Our eyes were designed by nature for our “hunter- gatherer” ancestors. They used their eyes to hunt at distance, and pick the occasional berries up close. These days, we are using our eyes up close more than for distance, resulting in a huge amount of stress on our focusing muscles. This leads to eye strain, fatigue and dry eyes from reduced blinking. An anti-fatigue lens has a “near activated zone” in the bottom with a focal power suited for viewing digital devices at near. This helps reduce the strain on the focusing system leading to less fatigue and more comfortable vision. The same set of measurements that apply to digital lenses ensures proper placement of this near zone. With age, the lenses in our eyes become less flexible, resulting in a decrease in our ability to focus up close. Progressive lenses are designed to have increased reading power the further down you look in the lens. In addition to the lens centration measurements for digital lenses described above, we also need to know how much your eyes turn inwards for near viewing. This ensures proper placement of the “corridor” of vision. 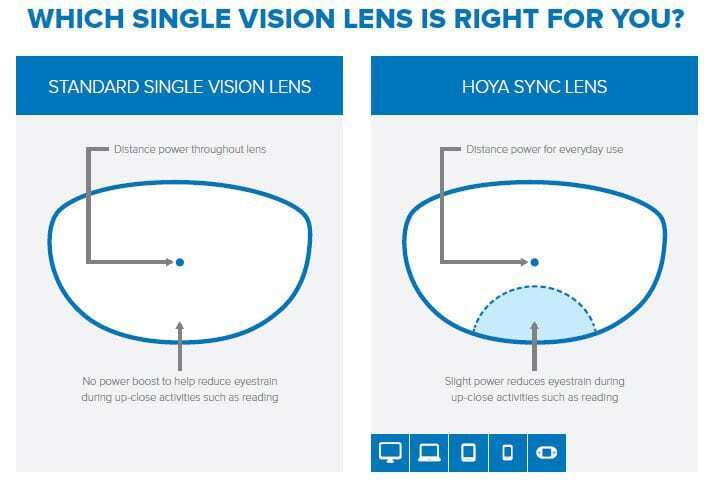 As the power in these lenses transitions from distance in the top to reading at the bottom, it is vitally important to have the optimal path of clear vision properly centered. These lenses are also the most confusing for the consumer – did you know there over 800 designs of progressive lens! Each one is unique in how the power transitions from distance to near. Those with higher distance demands prefer the reading area lower down, those who read a lot prefer it higher up. Some lenses are designed with wider distance and reading zones but have a very narrow intermediate zone, others have wider computer viewing zones but more side blur at distance. There is no perfect progressive, the design choice is based on what you need the most. For those that need very wide reading areas and don’t mind a line, there are always traditional bifocals. Higher end progressives will have less side blur because the prescription is controlled for points further from the corridor. These digital progressives take the frame fitting characteristics into account just like the digital single vision lenses described above to provide a truly customized lens for optimal vision. There are also designs that equalize the magnification difference between lenses, this is especially important if your prescription is quite different between eyes. These lenses are designed for computer users. Because progressives have relatively narrow intermediate and near focal points, both further down in the lens, they are not ideal for long term use on a computer. A progressive user has to tilt their chin up and do a lot of head turning to find the “sweet spot” for computer viewing. This leads to eye strain and are literally a pain in the neck! 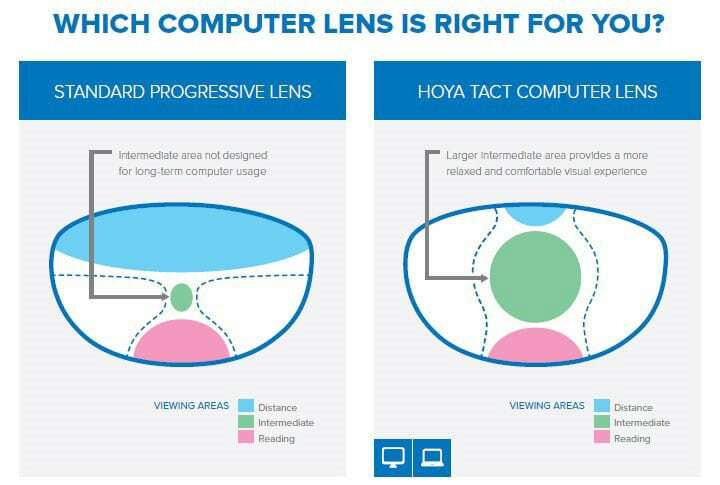 Computer lenses are custom designed so the focal point in the centre of the lens is at your computer distance. Above this point there is slightly less power to allow you to see a few metres across a room, and below this point is added reading power to allow you to read items up close and see your keyboard clearly. These variable near focus lenses have minimal side blur and allow wider fields of view than progressives. They can be customized for a slightly farther distance for those that need to see clients or get up from their desks more often. They are not suitable for driving or far distance viewing. 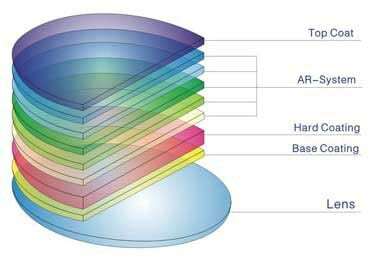 Almost all lenses nowadays have anti-glare coatings. They are NOT created equal. Basic single vision lenses often come pre-coated from the factory. These coatings can vary in quality and are often price dependent. Lower end lenses have few layers of anti-glare. The more layers, the better the glare reduction since each layer is specific for eliminating glare of a certain wavelegth. 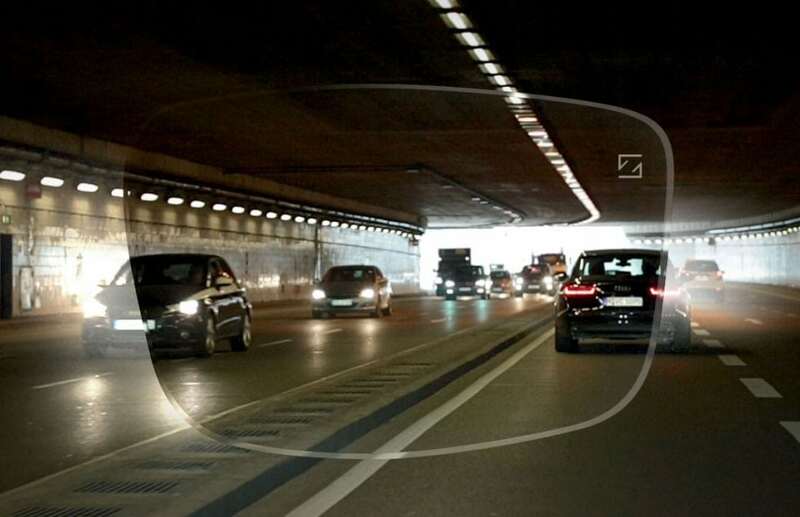 Good quality anti-glare coatings will transmit over 99.5% of visible light! Better lenses also have oil-resistant, water-resistant and anti-static coatings to make them easier to clean. To test if your lenses have these higher end coatings, put a sticky note on them and see if it sticks (it shouldn’t)! They should also bead up when you try to write on them with marker, but we don’t want you to try this at home. These lenses have a blue tinge to them since they are designed to reflect (filter) short wavelength blue light from LED devices. There is some evidence that long term exposure to this light at close distance can cause similar damage as that from long term UV exposure. This includes cataracts and macular degeneration. The studies on this are inconclusive at this time since these devices have not been around long enough to assess their effects long term. These coatings are great for heavy digital device users but be aware that they are less cosmetically transparent when compared to standard anti-glare coatings. This is a type of coating designed specifically for night and low-light driving to reduce glare. They are specifically tuned to substantially reduce glare from modern LED and HID headlights as well as street light glare and light scatter from rain and fog. They also have a blue tinge similar to blue light coatings. These are not coatings but films that are sandwiched inside your lens. Transitions or photochromic films are designed to turn dark in response to UV or short wavelength light. Good quality photochromics darken quickly and provide 100% UV protection, as well as turn clear more quickly than older type films. Polarized sunglass lenses are designed to reduce reflected light from horizontal surfaces. 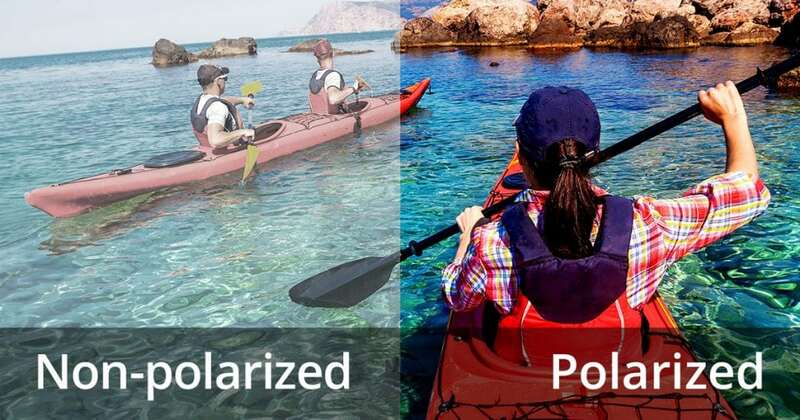 Some manufacturers use dual layer polarization for even better glare reduction. These provide the best clarity and glare reduction for driving, golfing, fishing, water and winter sports.